With this lecture we learn how external level changes on a pin can be used to generate an interrupt. We use the interrupt INT0 to detect such level changes without having to poll pins in lengthy loops. If a port pins output driver is switched of, by clearing its DDR/port bit, the logical state of the pin can be read in and, depending from this state, decisions can be made such as conditional branching etc. 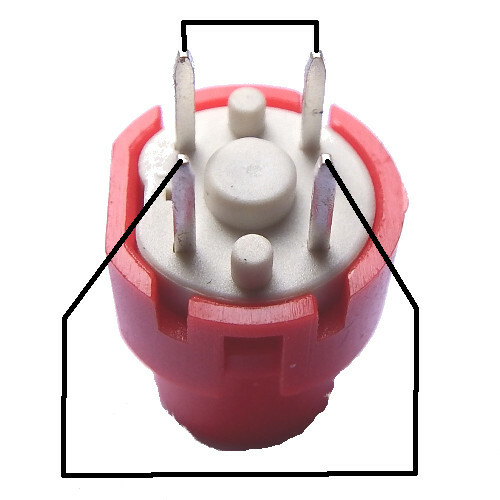 Now, what happens if the switch is defect or the switch is not attached to the pin? The input is open and, due to the extremely high input resistance on any changes in its proximity, e.g. electrical fields from the 50/60 cs/s electricity supply net, static voltages of fingers in close distance or level changes on neighboring pins. The result is an uncontrolled flickering of the LED. To end the flickering the input resistance of the port pin has to be reduced and a definitive level has to be applied. This is done with a resistor of e.g. 47 k. Now the open input has a defined high level, if the resistor is attached to the operating voltage. If the switch is closed the additional current is not very large (0.1 mA), even with a mouse piano attached (eight switches in a row). Note that the default level with such a pull-up resistor is high if no switch or key are attached. Why pull-up and not pull-down? This is due to historic reasons: the input of TTL devices were by default high, so why not have CMOS inputs on the same default level. The same applies if a key or push-button is attached: it is open by default. This is an example of a switch. If the switch changes polarity, this comes not into effect immediately. On a µs or ms level the switch is bouncing before reaching a steady state. In the example case 14 level changes occur within approximately 2 ms. Such a signal swarm can cause immense difficulties if as an AVR reacts very much faster than in ms time. We have to consider bouncing in such cases. Bouncing plays a role in the next lecture. The default, ISC01 = ISC00 = 0, is rather fatal because a low level on the INT0 pin triggers never ending interrupts, with leaving no time for any other activities. As the INT0 interrupt has the highest priority, no other interrupt comes through as long the low level on the INT0 input pin continues. The ISC bits are located in the same port, MCUCR, as the SE bits for selecting sleep mode and sleep enable. That is it and we can enter practical usage. A key signal starts the sequence of the duoled, that consists of two short and a third longer signal with the displayed timing. The program should be insensible against key bouncing. The duo LED is attached to port pins PB2 (anode red) and PB0 (anode green) via a current limiting resistor. The port bit combinations and the resulting colors are listed in the table. The key is attached to the INT0 input on PB1, the second key pin is on low (minus). 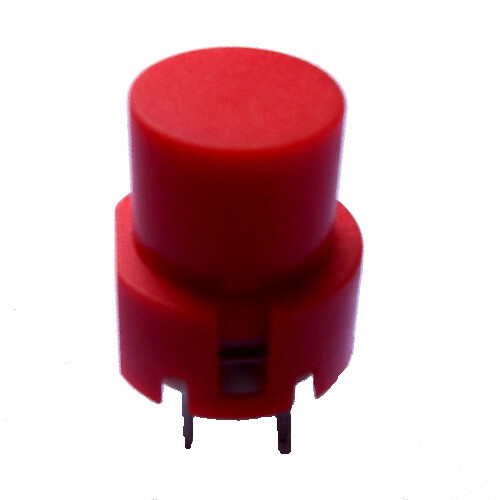 The duo-LED consists of two LEDs, a red and a green one, connected to two pins. Note that there are other types available with three pins. The longer connecting wire is the anode of the red LED and the cathode of the green LED. This is a key. With this type two of the pins are internally connected, pushing the key connects the four pins. This is a counting scheme. The counter counts down from six to zero, at the different values the on and off periods of the LED and its colors can be derived for the six phases. The count step duration is 0.25 seconds, which has to be derived from a timer overflow or CTC/compare match A interrupt. The counter starts with six and a red LED. Also, in phases 4 and 2 the LED has to be switched to red, in phases 5 and 3 to green. If the counter reaches zero, the cycle ends and can be restarted by the key. To ensure that the process is only restarted if the cycle has ended we need a flag that signals an active cycle. We use the T flag for that purpose. This also ensures that bouncing has no effect. The T flag is bit 6 of the status register, it can be used freely as it is not affected by any other instruction. To set this flag the instruction SET can be used, to clear it CLT is available. The instructions BRTC and BRTS can be used to branch if the T bit is clear or set. The instruction BST Register, Bit can be used to copy a bit in the register to the T flag, BLD Register, Bit to copy the T flag to the bit in the register. The INT0 ISR is simple: it simply sets the T flag. To achieve that the usual saving and restoring of the status register here would be adverse: the restore would override the changed T flag! Fortunately no automatic save/restore mechanism has been implemented, so we can skip this here. This is the CTC interrupt. To achieve cycles of 0.25 s duration we select a prescaler of 8, a compare match A divider of 150 for the CTC and an 8 bit software counter with 250 counting stages. This yields exactly 0.25 seconds (8 * 150 * 250 / 1200000 = 0.25). The ISR of the CTC decreases the cycle counter. If the counter reaches zero, a flag (bTo = Time-out) is set (to be handled outside the ISR) and the counter is restarted. The main flow diagram shows what has to done outside the two ISRs, after init and after waking up from the sleep phase. The first task is to detect if the counter is at zero. If yes then the T flag is checked. If set, a new cycle starts and the counter is set to six. If the cycle counter is not zero, the bTo flag is checked (which is set by the CTC ISR when a time-out occurs). If this is set, the next stage is handled. In any case the flow returns to the sleep instruction. the compare match A interrupt is enabled. The LED is switched to red and the cycle counter is started with 6.
tst rCntDwn ; Countdown count = zero? cpi rCntDwn,5 ; cycle = 5? cpi rCntDwn,3 ; cycle = 3? TST Register: tests if register is clear (equivalent to OR Register,Register. To simulate all these mechanisms we feed the source code to avr_sim and step through the sequences. The two pin outputs PB0 and PB2 are defined as outputs, their direction bits are set and their driver is switched on. As they both are low, the Duo-LED between PB0 and PB2 is off. On PB1, where the key is attached to, the direction bit is zero and the PORT bit is one, which switches the internal pullup resistor on. If we would read the PIN1 bit, it would be high. On PB1 the INT0 input pin is located. The software has enabled the respective interrupt enable bit on falling edges on this input, which will happen if the key will be closed. Now the controller goes to sleep mode idle and port B waits for signals on PB1. By clicking on the INT0 we initiate an INT0 interrupt request. If no other interrupts are executed, the INT0 interrupt will be processed with the next instruction. This would be the case even if another interrupt would be pending because INT0 is the interrupt with the highest priority (highest position in the interrupt vector list. The controller woke up from sleep mode idle, stored the current execution address to the stack and jumped to the INT0 vector address. From there he jumps to the interrupt service routine. The only task in the INT0 interrupt service routine is to set the T flag in SREG - to start a new sequence. After waking up, the controller realizes that the T flag has been set and branches with an RCALL to the StartSeq: section. By doing that, the stackpointer is decreased by two to store the calling address on the stack. The StartSeq: has set the downcounter in R19 to 6 to start a downcounting sequence. The CTC counter in R20 has been initiated to 250 to execute 250 timer CTC cycles. Note that the T flag in SREG is still set: it will only be cleared after the whole sequence of six phases has been absolved. Further INT0 interrupts therefore do nothing. The StartSeq: has brought the timer TC0 to count in CTC mode. The TOP value of the counter is 149, so the counter restarts after 150 pulses. The controller clock is divided by 8 in the prescaler, so that the whole CTC cycle lasts 8 * 150 / 1,200,000 = 1.00 ms.
After TC0 reached 150 (and restarted on compare match A) he initiates a compare match interrupt and the controller jumps to the compare match A interrupt vector. As calculated the first compare match interrupt happens after 1.0025 ms have elapsed. The "overtime" of 0.0025 ms is due to the fact that the compare match had to store the execution address to the stack, to clear the I flag in SREG and to jump to the vector address. If you need more accuracy in your application consider these time delays. In our application that makes no sense as the delay is always the same and as the human eye is not that fast and accurate. 250 CTC cycles have been absolved here. The bTO flag will be set now to signal the timeout. Execution time since timer start is rather accurate. Now that the bTO flag is set, it is time to change the color of the duo LED according to the phase diagram from red to green. The portbits PB0 and PB2 change here. This is repeated five times, with one color change omitted. After 1.5 seconds the whole cycle is over, the T flag is cleared and a restart can be initiated by the key.